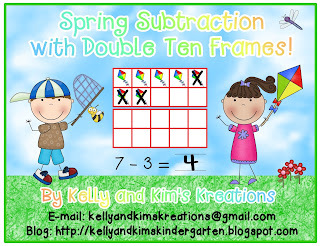 Kelly and Kim's Kreations: Springing into Learning Blog Hop! Are you ready for spring? We are!! The weather is starting to get warmer, the days will soon get longer, and the children will get wigglier. Spring time is one of our favorite times of the year to teach for so many reasons. The children are familiar and comfortable with the classroom routine and the day runs like clockwork. They also have developed a love for learning that is so wonderful to witness. These things help make it easy for us to teach some of our favorite themes: insects, flowers, farm, pond, oceans! Oh yes, it is a great time of the year to be a kindergartner!! 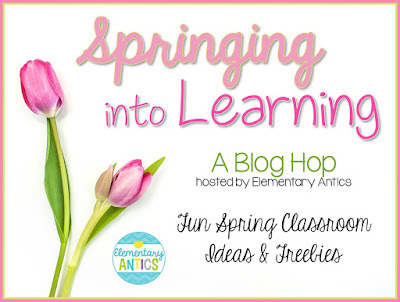 We are very excited to be part of this wonderful blog hop to give you a peek into the fun things happening in our classrooms. 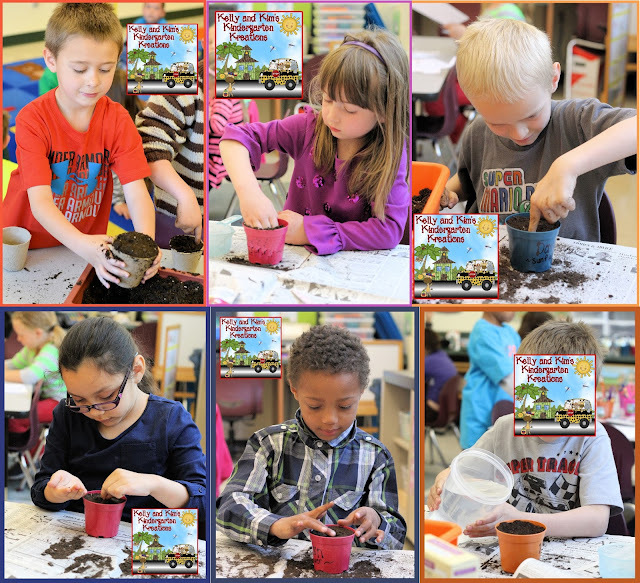 One of our favorite things to do in spring is to do some planting. We love teaching about seeds and how they grow into different plants. 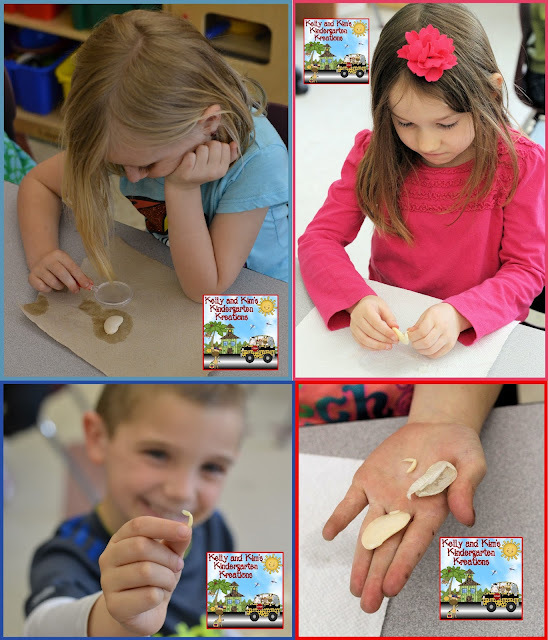 We first like for them to examine a seed and learn the different parts and the function of each. The children learn how to plant a seed and then go through the steps they have learned to plant different types of flowers and grass. We have even planted vegetables before. The children love taking care of their seeds and watching them grow. Of course the best part is taking them home to show off to everyone! 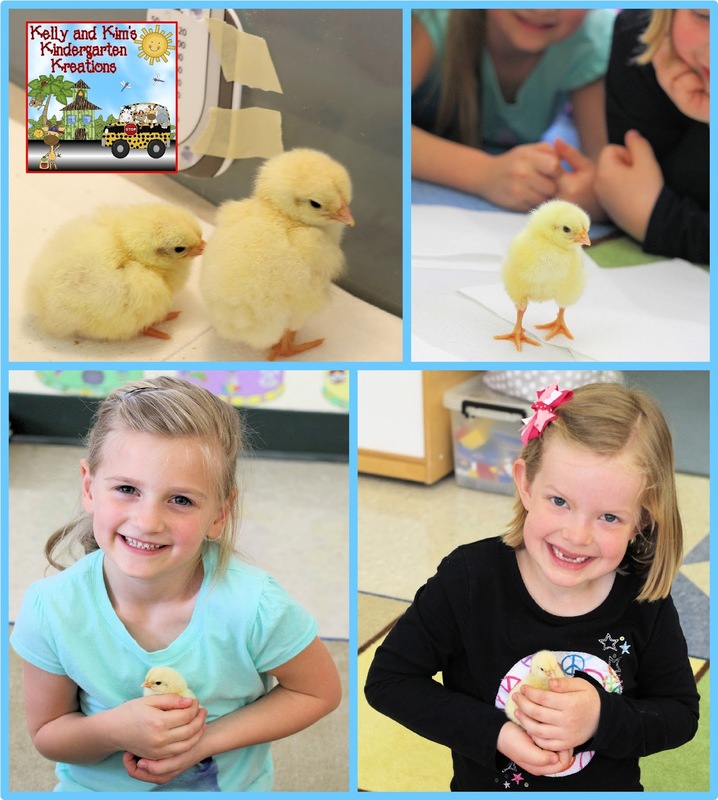 Every spring we also work with the local 4H to have the experience of raising chicks for a week. We aren't sure who is more excited about this, the children or us, but everyone LOVES this. The eggs come to us right when they are ready to hatch. We keep them in an incubator and they usually hatch within the first day. 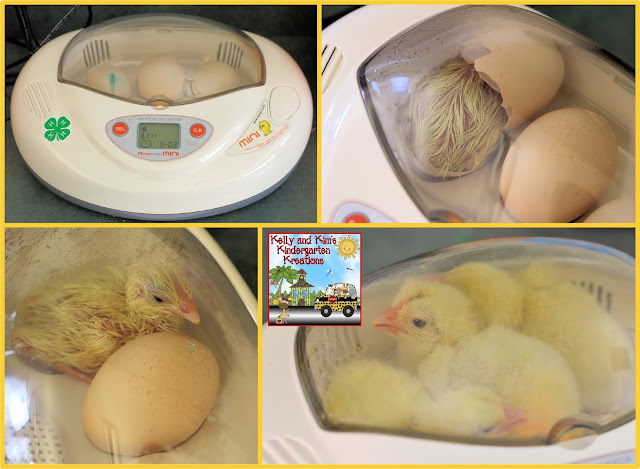 Then the chicks stay in the incubator for another day while their feathers dry off. After that we put them in a plastic tub where we make sure they have food and water for the week. We let the chicks come out of the tub and walk around the carpet and then the children get a chance to hold the chicks also. One of our most high interest themes is insects. We all have such a good time learning about the body parts and the many different insects around the world. There are some great books with photographs of insects we have never seen or heard of before, but they stick with the children for sure! There are so many different activities we do, but one of our favorite is to make an insect snack to help the children learn the body parts of an insect. 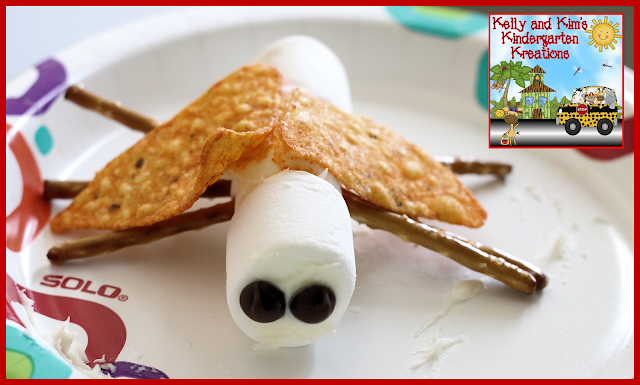 We use three large marshmallows (head, thorax, abdomen), six pretzel sticks (legs), two Doritos (wings), two chocolate chips (compound eyes), and frosting to hold it all together. 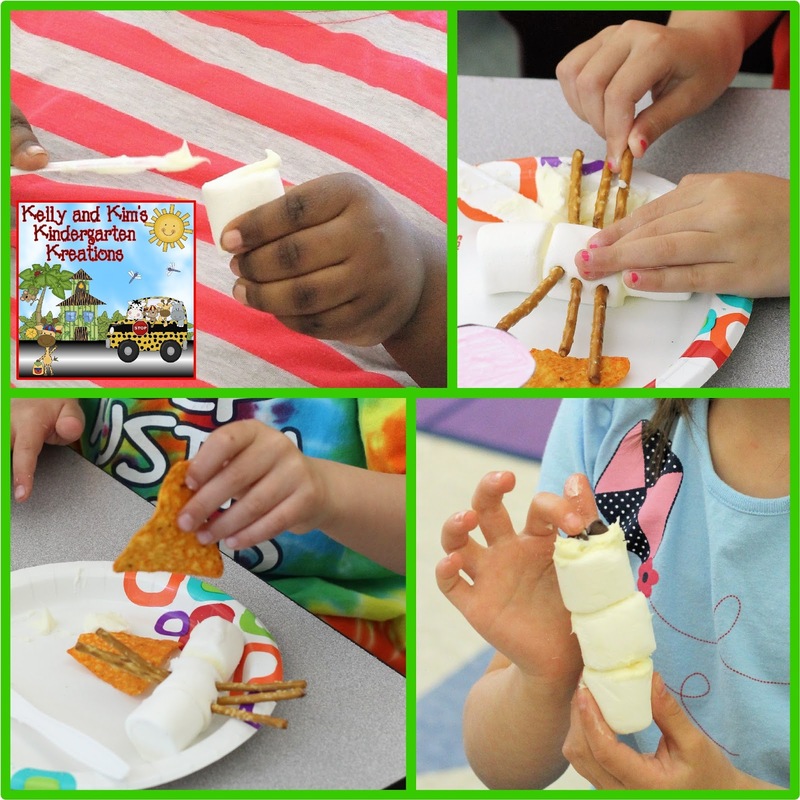 A very yummy snack with some learning thrown in as well! During our insect theme, we learn about butterflies. We learn about the life cycle and raise painted lady butterflies in our classroom. They come to us as caterpillars and when they are ready we let them go out into the world. While learning about the butterfly's proboscis, we make hats to become butterflies and then we pretend we have a proboscis too! We have a freebie for you just for stopping by and hanging out with us today. Our children have been rocking subtraction so we wanted to make a fun center for them which has also turned into a new center for you too! We hope you enjoy it. Don't forget to check out all of the other amazing spring ideas from these awesome bloggers below!! We hope you find some great ideas to try out in your classroom! Labels: butterflies, chicks, insects, plants, seeds, spring, spring activities, Springing into Learning! I love all of these ideas! I got to have chicks one time in my class and it was so fun! We've done the caterpillars a couple of times too and the kids always love it! Thanks for being a part of the hop! Thank you so much for letting us link up! It really got us excited for all that is to come for this last part of the school year! Very cute freebie! I can't wait to use it when we start subtraction! Thanks! Thank you so much! We hope you and your children enjoy using it! !